On this day in 1944 the Beechcraft XA-38 Grizzly had its maiden flight. 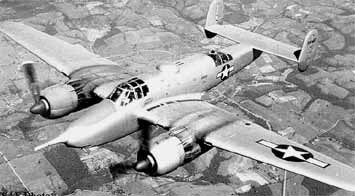 The Grizzly was designed as a ground attack aircraft designed to replace the Douglas A-20 Havoc. It was armed with forward-firing 75mm cannons on the nose for heavily armored targets and two forward-firing .50 caliber M2 Browning machine guns. Defensive weapons consisted of a remote controlled ventral and dorsal turrets armed with two .50 caliber machine guns. The aircraft proved to be very effective but it utilized the same Wright R-3350 engines as the B-29 and, as that aircraft had production priority, only two prototypes were constructed, with one being scrapped and the other was intended for the National Museum Of The US Air Force, although its final fate remains unknown.